This recipe makes a large batch so you can freeze what’s left. They defrost really well and are perfect for unexpected visitors or as a starter or light lunch. The lamb filling has lots of spices along with mint and crumbly feta – really delicious. I served it with a little golden kiwi fruit salsa (golden kiwi fruit, mint, drizzle of olive oil, salt & pepper). Egg white from 1 egg and a little water; as a wash for the pastry. Add oil to a frying pan and sauté the onion and garlic until tender. Add the coriander, turmeric and cumin and stir for a minutes or so. Lower heat to medium-high and cook the mince, add the stock and stir through. Once cooked turn off the heat and stir through the mint and feta. Pre-heat oven to 200 degrees C (400 degrees F). Cut the pasty into 9 squares. Hold the pasty square in your hand and add 2 teaspoons of the filling. Add a little water to the edges of the pastry and fold the corners together so you have a triangle. Using a folk, crimp the edge well. Repeat until all the pasty is used. Add to a baking tray and brush with the egg white and water wash. Cook for 10 minutes or until the pastry is lovely and golden. Suitable to freeze. If you plan on freezing some I would recommend cooking them until barely golden. When ready to use, take out of the freezer and place in the oven and cook until heated through and golden brown. I’m loving all of those Moroccan flavours. I’m making these ASAP. These look scrumptious! My husband is lebanese and enjoys a good lamb dish! I’ve never thought to make it into a puff pastry…what a delicious idea! 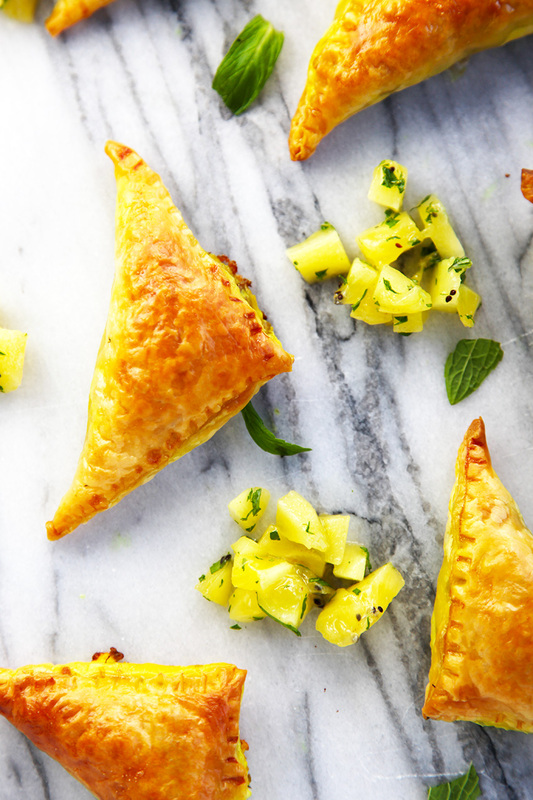 Your puff pastry is perfectly golden brown and eating these with a bit of golden kiwi salsa sounds delightful! Good tip on the freezing. These would be perfect for a dinner party, make them in advance and then just heat them. This looks so delicious! now I have to get the puff pastry sheets and try it out! drooling! hehe, thanks Priya, I’d love to know what you think of them. Loving everything about this one! Lamb + feta + puff pastry… yes please! These will be great to have in the freezer as a bit of an emergency snack. 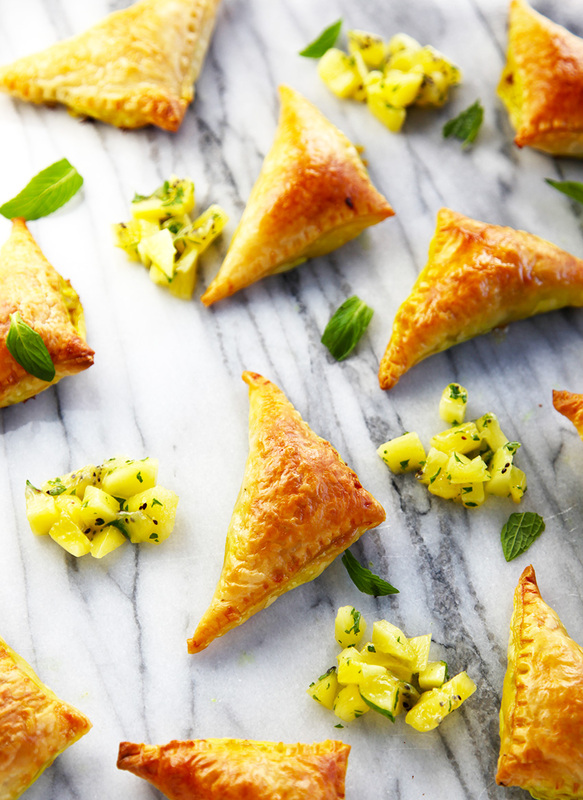 I have made something slightly similar with filo pastry, but love how these look and I bet they are tasty with all the Moroccan spices. Thanks Hanna, they are the perfect emergency snack. I was originally going to use filo but I’m glad I didn’t now. Although I’m sure they would be just as yummy! Lamb, curry, puff pastry…what a perfect combo of flavors!!!! I always thought puff pastry was difficult to make, thank you for de-mystifying it a bit. Yum!!! Thank you Sharon, yes the flavours all work really well. Although I must confess, I used store bought puff pasty for simplicity. I love making pasty but have never attempted puff pasty. I have also heard that it can be very time consuming. I must give it a go at a some point – homemade chocolate croissants could tempt me! Oh this looks fabulous Cristie ! All the flavors in this puff pastry is making me hungry. Never thought of making this with lamb.I’ll have to keep this in mind next time I make appetizers! Thanks for sharing. Beautiful pictures! We had a Moroccan night the other week. I made lamb meatballs..but next time I will make these! These pastry triangles look marvelous! So are the photos, Cristie. Pretty much anything with lamb and puff pastry make me happy and these little bites look fantastic! I bet they’d make great party apps. Recipes Made Easy. Lebanese meat pies or sfeehas are savory pastries that are traditionally served like pizzas or as little triangles of doughy bread stuffed with a flavorful ground lamb or beef filling. I have made these twice now and they are absolutely delicious. Just thought I would let you know. My son loves them too – bonus! This is a tasty treat for sure! I made it in my pie maker with puff pastry! It’s turned out beautiful!